Tips and information on the height requirements and regulations for light switches, electrical sockets, door bells and intercom systems etc.... in existing properties and also new build properties. Please also see our project on the New Wiring and Cable Colours for additional information relating to the height of sockets and switches. In this project we look at the light switch height and socket height regulations. These regulations are for new build properties only. If you are adding to existing wiring in your home or an extension that has been added to your existing property then you should be ok and you can match any new sockets or switches to your existing heights/layouts. However if you are unsure please consult a qualified electrician for advice. The rules and regulations concerning the electrical work that you can carry out in your property changes regularly. Please check out our electrical safety project before you begin any work as any work that you do carry out could mean that you invalidate your home and contents insurance and also affect the way in which you can sell your house! Also ensure that you isolate any electrical circuits before you work on them and make certain that they cannot be accidentally switched on while you are working on them. If you are less than 100% sure on what you are doing please seek help from a qualified electrician. 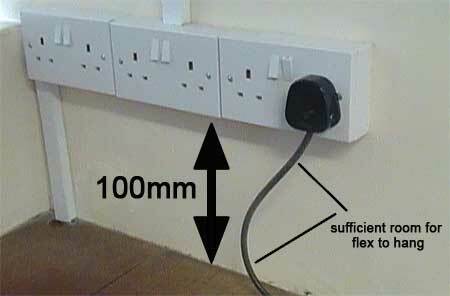 According to Part M of the building regulations and also British Standard BS 7671, the new building regulations concerning the height of switches and sockets and the way that they should be installed in houses states that they should be should be installed in a way that persons with limited reach can use them easily (these regulations do not apply to Scotland). As you can imagine these regulations have been put in place to ensure that those with some limited means can easily access any sockets or switches within a new build property. In respect to socket heights within the garage, utility rooms and other un-inhabited areas there are no real regulations governing the height that they need to be from the floor but you do need to be aware of height distances between sockets and worktop surfaces. If sockets are placed too close to the top of working surfaces then the flex attached to the plug of a given appliance may be damaged in the fact that it is bent or kinked at an acute angle. In light of this it is advised that sockets are placed at about 100mm above the working surface giving sufficient clearance for any cable or flex.